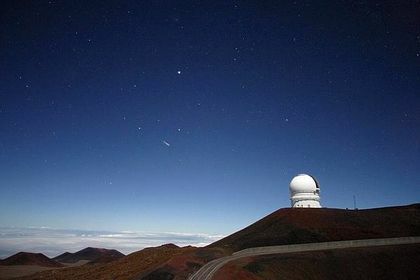 The Canada-France-Hawaii Observatory began operating in 1979 atop the Mauna Kea volcano in Hawaii. Canada’s participation meant valuable access to a world-class telescope for Canadian astronomers. 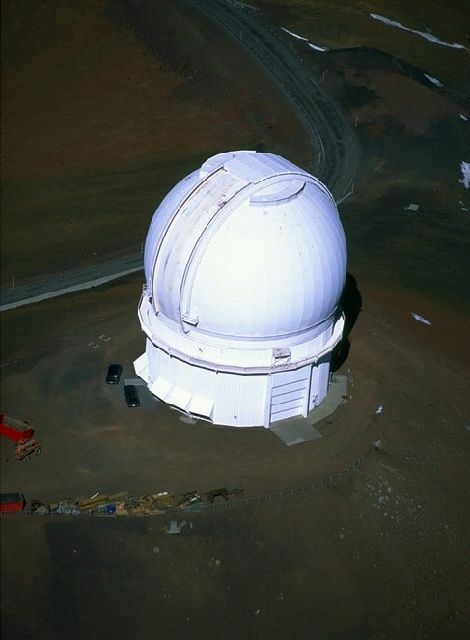 At the time of its inauguration, the 3.6-metre telescope was the sixth largest in the world and operated in the range of visible light and infrared. France launched the project in 1970 with the purchase of a 14-tonne glass disk. The state of Hawaii joined the project in 1971, followed by Canada in 1973. The three partners signed an agreement in 1974 and the Canada-France-Hawaii Telescope Corporation was born. Canada was in charge of polishing the mirror, putting into place a control system for the telescope, and constructing the observatory building. France was responsible for constructing specific mechanical parts for the telescope (tube, frame, etc. ), and Hawaii provided the site, a road to the site, and several instruments. The telescope’s mobile component weighed 250 tonnes and the total structure weighed 325 tonnes. In 1977, the headquarters and a library were set up at Waimea near the observatory. Canada was granted access to 42.5% of the available observation time, France 42.5%, and the United States 15%. Despite the fact that its 3.6-metre telescope was not the largest, the Canada-France-Hawaii telescope was nonetheless the most powerful in the world from 1979 – its first year of operation – until 1994 when the Hubble Space Telescope became fully operational. During that time, the exceptional site, the superior quality of the telescope’s mirror, and the constant improvements to its instruments contributed to the observatory’s ability to generate the highest resolution images ever produced. 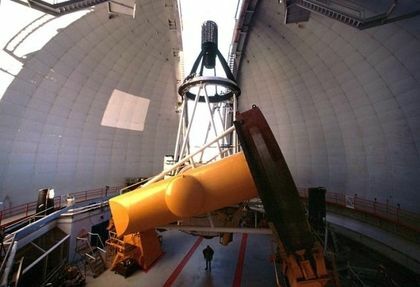 In 1996, an adaptive optics system was installed on the telescope that would once again rival the Hubble Space Telescope in the production of the highest resolution astronomical images. 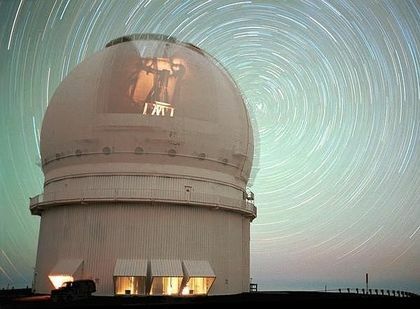 Adaptive optics is a technique that corrects image distortions due to air turbulence in Earth’s atmosphere. A well-known effect of such turbulence is the twinkling of stars. These new improvements quickly bore fruit for the Canada-France-Hawaii Observatory as it was involved in discovering – or confirming the discovery of – many new moons, gravitational lenses, and so on. For example, astronomers Brett J. Gladman and John J. Kavelaars discovered three new satellites around the planet Uranus in 1999 (Prospero, Setebos, and Stephano) and eight around Saturn in 2000 (Siarnaq, Tarvos, Ijrak, Thrymr, Skathi, Mundilfari, Erriapo and Suttungr). The discoveries of other moons around Uranus and Neptune were announced in 2001 and 2002, but have not yet been confirmed. In 2003, a new imaging system known as MegaPrime was installed. MegaPrime uses the French-designed MegaCam camera that is able to take 340-million pixel images (about 18,400 x 18,400 pixels), making it the most powerful camera of its type in the world. These days, the observatory is involved in the study of the solar system, the birth and evolution of stars, the interstellar medium, the structure and content of galaxies, galaxy clusters, and large-scale structures of the Universe. The Canadian participation in the observatory is managed by the National Research Council of Canada’s Herzberg Institute of Astrophysics.